“You’re not a rider until you have fallen off seven times”. How many of us have heard this saying? 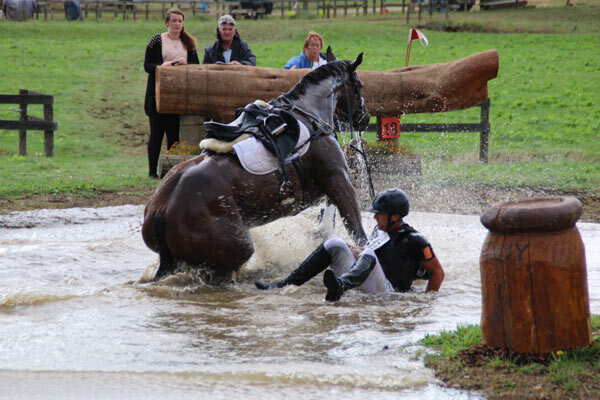 Many riders are fortunate, they have not had a serious fall in their riding careers. Others are not so lucky, and have to work hard to rebuild their shattered confidence, writes psychologist April Clay. Physical fear in the sport of riding is a given – we are dealing with a powerful and sometimes unpredictable animal. All riders possess some physical fear at some point in their riding career and usually for good reason. Fear is a very useful emotion, obviously if we didn’t have any fear, we wouldn’t be able to tell if we were in danger. Still, fear in excess can be paralysing and irrational and does need to be addressed. Having a major riding accident is like having any kind of accident for the first time, it shakes our belief system. As human beings, we have this tendency to go around thinking we are invulnerable until something comes along to challenge that notion. The reactions you may experience after an accident will vary, but I find that there are four general ways in which people may respond. First, some people will experience an avoidance reaction. They may avoid going out to ride, or make excuses about why they can’t have a lesson or do a particular exercise. I remember one young rider whom I was teaching who was afraid to canter. Every time I instructed the group to canter, he would go into the middle of the ring and begin to fix his boots. Second, it is possible you may experience a reaction of ‘freezing’. That is, you may assume you can get back on and jump that oxer, but when you find yourself nearing the actual fence, you pull your horse away or pull up. Third, you may respond by becoming ‘hyper vigilant’, or feeling jumpy and extremely conscious of every move you or your horse makes. If you are experiencing such a reaction, you will probably find it hard to ‘let go’ and just ride. Finally, you may experience a reaction in the form of excessive anxiety that was not present prior to your fall. In other words, the butterflies are going crazy in your stomach, your heart is pounding seemingly right through your chest and you feel as though you might pass out. It may feel very much like a panic attack. Whatever your reaction, the very first thing you should do is analyse what happened. Accidents occur for many different reasons, and how you proceed to deal with it will in large part depend on this factor. Analysing also tends to have a calming effect, as you shift into a logical mode of thinking as opposed to an emotional one. As mentioned, there are numerous reasons why accidents occur. Many, many accidents happen to athletes and in general because of preoccupation with other life stressors. These stressors may include marital discord, school difficulties, life transition (graduation or marriage), financial difficulties and other ‘life changing’ events. So ask yourself – have there been things going on in your life that may be draining all your energy and concentration? Other times accidents occur because we just lack good common sense (ie. : “I knew my horse was incredibly fresh after a week off but I just got on him anyway”). It also could be that you were attempting a task which was over your skill level, or that you got a little too overconfident and took a risk with very poor odds and you happened to lose. Sometimes, of course, we simply guilty of being mindless! Unfortunately there is no way you can escape this condition, unless of course you happen to be inhuman. The point is, you can ease a lot of fear if you carefully go through what happened, and what’s more you may discover it may only be a matter of correcting a very obvious mistake. One of the worst things you can do after an accident is to deny your feelings and play the “tough cookie” routine. If you deny your feelings you could be setting yourself up to do more damage. This is a situation I have seen many times and experienced myself. If you ignore what happened, and begin before you are psychologically prepared, the ensuing tentativeness or overcompensating boldness could lead to another injury or a further loss of confidence. Sure, you have to have some degree of ‘mental toughness’, or be able to push through some fear and apprehension. Just make sure you are doing it for the right reasons (remember, you don’t need to be anybody’s hero but your own), and that your outlook is tempered with some common sense. You should also take care to ensure that you are adequately physically prepared before you begin riding again. I’m not suggesting that you wait until you are 100%, but rather that you assess how your injury will affect your riding. For instance, if it is the type of injury that will affect your balance, and you begin too soon, again you may be asking for another accident to happen or risk losing confidence in your skills. Take it slow: unless you have an impending competition, it is a good idea to take things slow when you resume riding. This may also mean ‘bumping down a notch’ in terms of what you do in lessons, such as jumping smaller jumps or not riding without stirrups. Build physical strength/basic skills: to increase your sense of physical security, you may want to really concentrate on building your physical strength. You don’t necessarily need to ride for this, although you can. It can be just as effective for you to go to the gym and work on those legs! In terms of focusing on basic skills, like body position etc. this can not only increase your sense of security on a horse, but also give you something positive to focus your attention on. Realign your self talk: when we experience anxiety, we are always conveying certain messages to ourselves. You may not be aware that you are sending yourself messages like “I know I will fall off again if I try that fence” or “I cant ride at all, whatever possessed me to think I could! ?” If you catch yourself talking in your head like this, tell yourself- ‘STOP!’ and then replace those thoughts with more reasonable, positive ones. For example: “STOP. I am feeling a little bit anxious about riding again, but that’s normal and I can still ride with that anxiety. I am feeling more confident riding everyday.” If you are having trouble with the strength of your negative thoughts try this exercise: pretend you are a lawyer and you are being asked to refute a belief (your negative self statement) by gathering and presenting all the evidence to the contrary (ie. : what exactly is the probability that you will fall off again, given the facts of the situation?). This approach is not only effective in terms of getting you logically, as opposed to emotionally oriented, but also has the tendency to inject some much needed humour into the situation! Visualize yourself correcting the problem: if you have discovered that the accident was indeed due to a technical error, then you can visualize yourself performing correctly. One big caution with this: make sure you do find out, from a coach preferably, what exactly it was you should have been doing (like shifting your weight to the outside when riding a corner) and concentrate on that in your imagery sessions. You cannot effectively visualize by telling yourself “now I see myself not doing that”, because the brain cannot process ‘not’ very well and usually goes with the doing that part of the statement (ask yourself, what does ‘not’ shifting my weight to the inside when riding a corner look like?). Relaxation training: there are lots of people who are not even aware they have excess tension in their body, and as everyone knows, this can have a really adverse impact on your horse’s confidence as well as your own. An exercise which is easy to practice at home is what is called progressive relaxation: lie down comfortably with your arms stretched out at your sides. Start at either the top of bottom of your body, working your way to the other end, alternately tensing and relaxing each major muscle group. Hold the tension long enough to remember what the sensation feels like in that particular area, before letting the tension go. If practised frequently enough, you will be able to quickly assess, even in a competition situation, whether or not you are properly relaxed or have excess tension in your body. If you don’t practice the skill of relaxation already, then you should be! I believe relaxation is the most important skill a rider can possess. Think about it – the way you communicate with your horse is through your body, and the more relaxed you are, the smoother this communication will be. How you begin to build up your confidence after an accident will depend on your unique situation and your individual personality. Some of the factors which will make your situation unique include: age, experience level, coach, urgency of situation (competition), presence/absence of injury, injury type/severity and previous falls. It may take some time to sort out the best approach for you, or if it feels overwhelming, you may want to invest in some outside help. April Clay is a Psychologist and former rider, instructor and judge residing in Calgary, Alberta, Canada. She regularly instructs riders in sport psychology skills and has just completed her first book, “Training from the Neck Up: A Practical Guide to Sport Psychology for Riders”. First published on Horsetalk.co.nz in 2000. I have had hundreds of falls!! The hard part is getting back on without thinking it will happen again. ilovehorses – I have a student who also had a hard time dismounting. I set up a ‘barrel’ horse (an actual barrel on a stand) with a saddle so she could practice dismounting safely. Even though her feet were only about 6″ from the ground, she still found this challenging at first and would freeze. But after many, many repetitions, she was comfortable and able to flow through the dismounting process. Then we worked with a very quiet horse who stood at the mounting block quietly while she repeatedly mounted and dismounted. By the end of the session, she was much more comfortable with dismounting and was doing it gracefully instead of freezing up. Thanks this helps me alot as i have had very naughty ponies and it has effected my riding alot! i am 13 yrs old and have grown up around horses. i have two of them. one is the mom and the other one is the son. i have been riding them fkr quite some time and i thought that i would like to try some horse riding lessons. my first english lesson was amazing, i got to ride a calm, and easy horse named ruffy. i felt very confident and thought that i woukd be an amazing jumper when i have more lessons. after like 3 lessons my instuctor said i could ride a huge draft horse named black jack. he was really hard to control and get over the jump. after a few tries i finally jumoed over the pole. but i guess black jack got really excited so he started to buck. me being a beginner fell off and got the wind knocked out of me. after that experience i lost a lot of confidence and was really scared to get back on th horse. after the next few weeks my teacher said that i was going to ride a four year old horse whos name was carson. he was a little jumpy but still very nice. he wasnt very trained so he was kinda confused on how to jump. after working with him a bit, he finally jumped. but just like black jack, he got excited and bucked. this time was even worse than getting bucked off black jack. i hit me head on the side of a bar and couldnt breath. that all happend last week. this week i am really scared to ride a horse again because i dont wnt to get hurt. i really need some advice. my instuctor is REALLY STRICT and doesnt seem like a fun person to talk about this to. i feel so much pressure and want to take it easy but im afraid to ask my teacher. PLEASE HELP!!!!!! It sounds to me like you need to find a better instructor. These two do not seem to have your safety in mind. They should not be putting you on horses that are not comfortable jumping. Your safety is more important than progressing too quickly to horses that are not calm or not used to jumping. out as it set wonky. I’ve been led round on my horse who prior to my accident I had only had for 6 months but really want to get my confidence back before I have my other opp as will be 6 weeks laid up ! not sure how to go about it as need someone to hold her when I get on and off as not very quick at moment. Hi I am currently 16, I have had my horse for two years now. She is currently 10, she is a very sweet horse. I got bucked off a few months ago and both my mom and I are nervous for me to get back on. My Aunt and I are the only two to have riding experience and a love for horses. My friends mom gave me lessons, we also shared a lease on a field. She ended up getting some land of her own and now I lease it by myself. I have been struggling to get back on, and with no help it is more difficult. My horse got spooked by a dog since a bunch of houses line the field. One of the peoples dogs got out and spooked her. Dogs get out all the time and I am nervous to get back on her and her spook again. I cannot afford a trainer right now but want to continue my riding with her and I love my horse very much. Does anyone have any advice? Hi! I have been riding for 4 years, and about 3 of those four years I have never had a confidence problem. I rode many different horses, started jumping and moving up in dressage, and I couldn’t be any happier with my riding. But, this last April, my horse did a huge buck and I fell off and broke my arm badly. I was off for three months and had no problems getting on again, but these last few months, I have been terrified to jump, and it’s to the point where I think the worst when he’s trotting and cantering, and I worry myself so much that he gets worried. I can’t seem to get my confidence back very well at all. Does anyone have any advice or tips? * I got to stop leaning on a “trainer” to give me confidence and instead find it within myself. No matter the pace, I’ll build upon it – inch by inch. *I’m a relationship kinda girl. I want to learn and build confidence on my horse, and have that unbreakable partnership. Not lessons on another horse and transfer what I learned. Because of my lack of confidence, I don’t trust every horse and just because someone tells me there horse is safe, doesn’t mean it is. Nor do I feel confident to transfer what I learned on my horse by myself. *I adore my horse that first spooked with me. I will admit I was curious what it would feel like to fall off her back while riding, and she was kind enough to show me. :o\ She is the sweetest kindest horse. And very smart clearly. But I needed a horse that was sweet, kind and smart enough to not listen to my stupidity. And now I have her as well and she sets the bar so high, I don’t think I could ever find another even comparable. She isn’t lacking in any area’s of training and can help me with all the endless area’s I’m now lacking in. *I bought myself a hit-air vest. I did quite a bit of research and although it’s pricey, I think it’s a great investment. I may feel falsely safer and this maybe unnecessary as I don’t have big plans to go race over anything or anywhere, but if I fall and it’s cushy, life will be just that much better! Now I have a sane, very pretty, well trained horse, a great helmet, hit air vest, and inch by inch I am going to gain my confidence back! You may see me out there riding, and please wave a big hello. I’ll be the one heavily padded with an big helmet, on a gorgeous flea bitten mare. *anyone can call themselves a trainer. Do the research for a proper fit. Some trainers are only about horse showing, jumping, etc. Safety is #1 for me as well as happy well trained horses, good equipment, good safe practices all around. Trainers are a dime a dozen, so if it’s not a good fit, move on to the next. It’s not personal, it’s business.